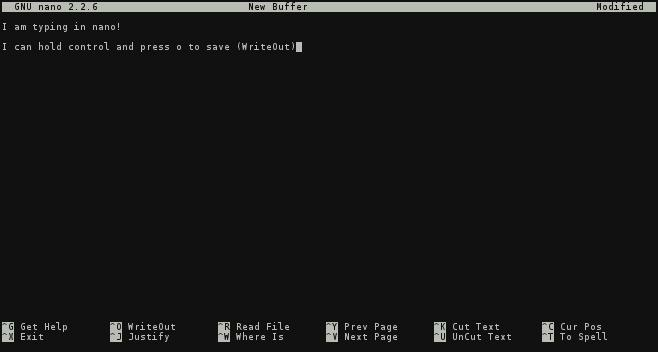 A shell is a text-based user-interface for a computer. Shells are the programs which allows you use a computer via text-based commands. Not to be confused with a terminal, which is the environment a shell runs in (GNOME terminal, tty1, etc). A shell is run in a terminal, a terminal is the widow you use the shell in. As with all things in Open Source, there are many options to choose from when deciding on a shell. Below is a short list of popular choices. Each shell has it’s positives and negatives. If you don’t have an opinion you should probably use what comes by default when you open your terminal. sh Required by all POSIX Operating Systems. bash Default on most GNU/Linux-based Operating Systems. zsh The hip new shell on the block. fish Yet another hip new shell on the block. Invoking a program is simple: type the name of the program into the terminal and press Enter. For instance, to start top enter top in your shell and press the Enter key. Flags (sometimes called Switches) specify options for running a program. Example: you want to find the version of a program. To do this you would run <command> --version. Each program defines it’s own command-line flags. The rule of thumb is to run <command> -h or <command> --help to get the list of possible flags and sub-commands. Just like a program or script can have variables, your shell can have variables which can be read from, written to, and modified. To see a list of variables and values run env. To set a variable run export YOUR_VARIABLE_NAME=<value>. To print a particular variable run echo $VARIABLE_NAME. Pipes take the text output from one command and pass them as the input to the next program. Pipes can be chained, meaning the output of program foo can be passed to bar which can have it’s output be passed to baz. Example: run this exact command: $ ps aux | grep $USER | less. Hint Build this chain incrementally. First run ps aux, then add | grep $USER, etc. A directory is like a folder. You will find yourself “in a directory” a lot while navigating an OS via the shell. This is just like you having a folder open on your desktop. The Root of your directory structure is the base directory which contains all other directories. Since all other folders are contained within it, one can think of this as the ‘root’ of a directory ‘tree’. Hint: Run tree / in your shell. Your $HOME is the root of your user’s directory tree on the OS. This is analogous to your desktop folder. The most basic job of a shell is to enable the user to execute programs and navigate the OS. Below are a few of the commands you will use to do this. # Navigates to a new directory. # Prints a string to the screen. $ echo "some thing $AND_VARS"
# Prints the contents of a file(s) to the screen. # Prints a file to the screen so you can arrow up/down. # Prints environment variables to the screen. # When in doubt, always type help. Shell scripts are files which contain command run on your behalf by the shell. Each shell is also a programming langauge, so you can write logic, loops, functions, and declare local variables in your scripts. echo "Your username is $(whoami)"
echo "Your home-directory is $HOME"
echo "Your current directory is $PWD"
echo "Your computer's host-name is $HOSTNAME"
You should also read the EXPANSION section of the bash man page. File Paths describe the location of a file in the directory tree. Files are an important part of using an OS through the shell. Being able to find, navigate to, and use files is important. The first part of doing that is understanding some basics about directories. / Separates directories: one_dir/another_dir/last_dir Alone, or at the start of a path, it is the root directory. When using a shell (and in general) there are special characters. These serve a functional purpose (carry special meaning) in addition to being a character, so you can’t use them willy-nilly. You should know what those are and what they mean. Used as a stand-in for any character(s). Example: cat *.log cats all files in the current working directory ending in .log. Used to specify the end of a regex. We’ll cover what regex is later. Used to specify a set. Escape special characters (treat them as normal characters) with the escape character (\). Pressing the tab key auto-completes a command, file-path, or argument in your shell. Pressing tab multiple times completes the command to the best of the shells ability and then lists the possible completions (if there are any). We are going to with a quick tangent by learning to use the terminal-based text editor Nano. Arrow keys used to to navigate the cursor. Nano is a great terminal text editor to start with. Later in your career you may start using emacs or vi/vim but to start with nano is familiar, easy to use, and gets the job done. To use nano simply execute it like any other command in the terminal. This editor is almost exactly like any word processor or plain-text editor except that you don’t have a mouse – only keyboard shortcuts. The instruction bar at the bottom of the screen is explains all of the key-bindings from saving, to exiting, to cut and pasting. Now make the script executable using chmod and run the script. What does it do? When you pass arguments to a bash script, you can reference them inside of the script using $1, $2, etc. This means if you do something like ‘foo.sh bar‘, $1 will return bar. You can also use $@ to reference all arguments. You can also take input using the read command which then stores it in a variable. If you pass read ‘-a‘, it puts the input into a bash array. echo -e "Tell me a word: \c"
echo "Your word is $word"
echo "You did not say foo"
Using the tar command, write a script named backup.sh which backs up the dobc user home directory into a file /tmp/dobc-backup.tar.gz . Hint: use the man page for tar or type ‘tar -h’. Create a script called args.sh that takes three arguments and prints all of the args and then prints them in reverse using echo. Create a script named input.sh which takes input for three args and then prints them in a sentence (of your choosing). Create a script named ifelse.sh which takes two arguments. If both arguments match, print "Yay, they match! ", if they don’t, then print "Boo, they don't match :(". Bonus: How could you list the contents of the file? Bonus #1: What happens if you give the script nothing? Bonus #2: What happens if you give it the string “DOBC is awesome” with quotes? echo -e "Tell me a noun: \c"
echo -e "Tell me a verb: \c"
echo -e "Tell me an adjective: \c"
echo "I plan to $verb a $adj $noun"
echo "Boo, they don't match :("
A free online resource of learning bash programming. Covers some concepts we’ll get to later in DOBC, but a good resource to have on hand. An in-depth exploration of the art of shell scripting. Covers more advanced concepts with Bash. This video demonstrates what happens when you ‘delete your hard-drive’ on Linux. A fun watch!